USA Presidential election campaign speeches are so much more interesting and inspiring than the election campaign speeches given by Australian politicians. Personalities play a big part in deciding US elections (as does the Supreme Court for the cynical among you). I enjoy listening to campaign speeches in the US elections and Mitt Romney's speech at the 2012 Republican convention was a doozie. The video of his entire speech is embeded below but it was his closing comments from about 30 minutes into the speech onward that really caught my attention. Mitt talks about the threat in Iran and notes that Obama's diplomatic talks with Iran have achieved nothing. He reinforces the idea of a United America and highlights the many soldiers that have died fighting for the values and freedoms that America enjoys. Which got a big cheer. I wonder if anyone who'd actually lost someone in the Afghanistan or Iraq conflicts were cheering? Do those people feel any more free now for their loss? The quote that particularly left me dumbfounded was, "That a united America would preserve a military so strong that no nation would ever dare to test it." After all the recent ongoing conflicts do Americans really want to put more of their citizens on the battle front. Seriously? If talks aren't working in Iran what do these people suppose Mitt has in mind - and does he really think Iran wouldn't fight back just because America has a strong military? I could go on but it was his brief points about America's relationships with various nations and his desire to create an army so awesome all it'll be doing is sitting around navel gazing (since no one's ever going to test it) that inspired my latest GoAnimation music video, The Holy Grail - Mitt Romney featuring my favorite song by Aussie Band, Hunters & Collectors, The Holy Grail. The song starts with the idea of the biggest army the world has ever seen. From there I tried to pepper the clip with little digs at things Romney has either said or I've heard him or his party talk about in their values and ideals. As well I tried to match the visuals with the lyrics of the song. See how many you can spot. 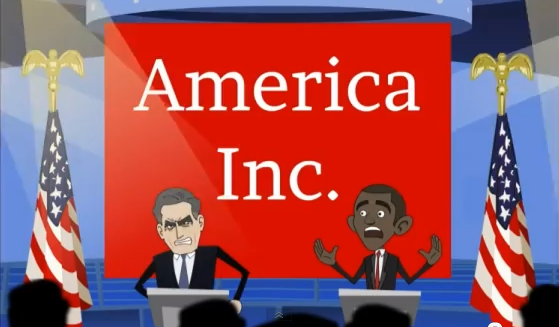 As far as making the animation goes, the explosions, some background photos and the wings on Obama are all that isn't stock GoAnimate content. (The wings are an original custom prop I made for Episode 2 of How to Get Views the Evil Genius Way. The explosion is a community prop and the photos of Wall Street and the Dept. of Treasury are from various sites). I figured since the song is describing a dream then an army of Mitt Romney's wouldn't seem out of place. I then just carried this idea through with multiple Obamas and and army of George Bushes too. I had hoped to show a much bigger army of Romney's marching along but once you get too many moving characters into the GoAnimate studio on a single scene it starts to slow things down considerably. Other than that I pretty much made up the scenes as I went taking inspiration from the song lyrics and trying to make every scene count by incorporating those little digs at Romney wherever an opportunity presented its self. "In the biggest army the world has ever seen..." (an army of Romneys) - obviously a reference to Mitt's comment mentioned above. "The Holy Grail" - Mitt's constantly reinforced his prowess as a successful business man and seems to push this as his number one qualification for running the country. I think his 'Holy Grail' just might be getting his hands on the countries money and seeing if he can turn a profit, err... surplus. "Started out seeking fortune and glory..." - umm... successful business man now seeking Presidency. "The great crusade..." - reference to the Afghanistan and Iraq wars. Osama standing with a sign "No Need to Hide" - They found Suddam Hussein hiding in a hole in the ground. Hard to believe no one knew Osama was living in a house on the border of Pakistan. Without the so called leader of the 'War on Terror' it's hard to keep that agenda going don't you think? "We ran into millions and nobody got paid..." - seemed like a good point to highlight the 99%'ers as well as Obama always pointing out that Mitt's always going to be looking out for his rich friends. War = Jobs - it's not something the Republicans will come right out and say but aside from an increased need for soldiers during a time of war there's all the sideline jobs as well, e.g. manufacturing weapons, as well as plenty of rebuilding after you destroy your enemies cities and infrastructure - plenty of contracts there to be put to tender to US businesses. Sign: "47%'ers get a job!" - Mitt said at a private function that 47% of the population were sponging off well fare payments (well something along those lines). The comment got him into a lot of trouble when it was made public. I imagine a lot of those 99%'ers are probably surviving on well fare. Sign: "We'll be back for our 3 Trillion on Monday", empty treasury vault - it was all I could do not to sign the bottom of that sign with 'China'. I think Mitt mentioned a figure of about 3 trillion in debt to China at some point in the first Presidential debate (around the same time he mentioned cutting spending on Public Television). The numbers are moot though. Both Mitt and Obama agree the country is massively in debt so there really isn't any money for Romney to go crazy with if he wins the election. "...and you know what they say, nobody deserves to die." Headstone engraved with 'Obamacare' - I think the line in the song perhaps reflects the spirit of Obamacare. i.e. no one should 'die' due to a lack of access to medical care. 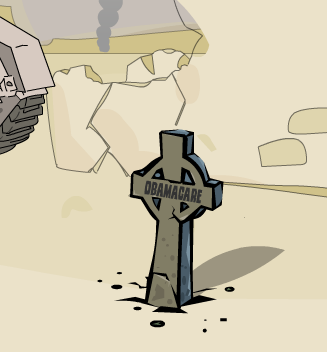 Mitt on the other hand wants to scrap Obamacare because he believes it's causing a massive blowout in healthcare funding... hence the headstone. "I've been searching for an easy way..." Romney and Ryan looking through a financial document for 'loop holes' - The only explanation I've ever heard for how Romney plans to pay for some of his initiatives if elected is by closing loop holes in various policies, programs etc. as well as cutting spending on things that are being paid for by loans from China. Clinton Sax Solo - we all know former President Clinton can play sax. Since he was one of the key speakers at the 2012 Democratic Convention it seemed very relevant to at least include him playing over Mitt's 'low'. "God knows where I've been...", Sesame Street Sign - In the First Presidential debate Mitt declared he likes Big Bird whilst declaring he's going to cut all funding to Public TV as apparently that's funded by loans from China. God only knows what possessed him to mention a much loved character along side cutting funding and, after the comment went viral, he might be wondering how he ended up on Sesame Street. "I'm still here. I'm still a fool for the Holy Grail" - despite a few suspect comments that may have hurt him with voters, Mitt's still very much in the race. At the time of writing this post polling was showing a very close race. You can read what you like into the word 'fool' in relation to Mitt. 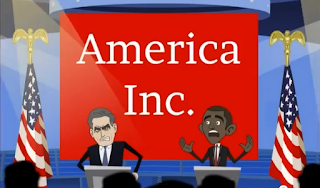 Banner "America Inc." - The key message I get from Romney is that America can and should be run like a business. It's one of his tent pole initiatives. Whilst running a country is a lot like running a business Mitt doesn't seem to understand that Government is about people more than money. However financial responsibility is certainly one of the stronger messages in his campaign.